I got a little bit more done on this doll quilt today. Yesterday I got as far as piecing the Dresden wedge. Today I picked out the background (Kona Cotton in Charcoal) and used my Accuquilt Go 1.5" strip cutter to make quick work of cutting my scraps into perfect 1.5" squares. It literally only took me like 10 minutes to cut 70+ squares. Gotta love time saving tools! Hopefully I can get the borders all pieced tomorrow. I still have to attach the background to the Dresden and figure out what I want to use for the center. Right now I'm leaning towards a Charcoal center because I love the graphic look of it thus far. If you want to read my Accuquilt Go review and tutorial on how to cut squares with the Go see this post here. This looks so great with the dark background and frame of colours! I agree that a dark centre would be dramatic. I am looking forward to seeing the final finish! It is amazing! 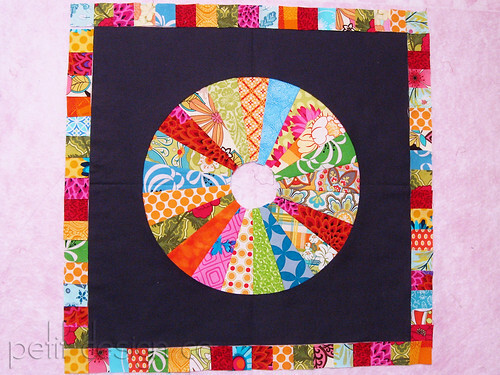 I am so jealous...I want a AccuQuilt Go!! I love the dresden and the colors are lovely! Nicely done!